Push Your Luck Podcast: No Wines, Much War, Wow Indians ! 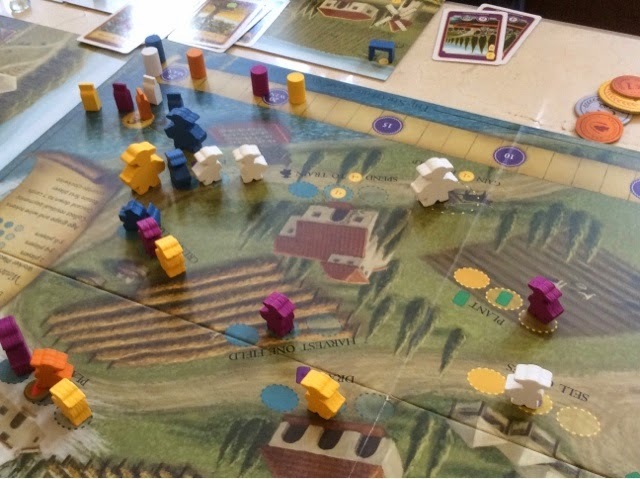 We started with a game of Viticulture + Arboriculture expansion. 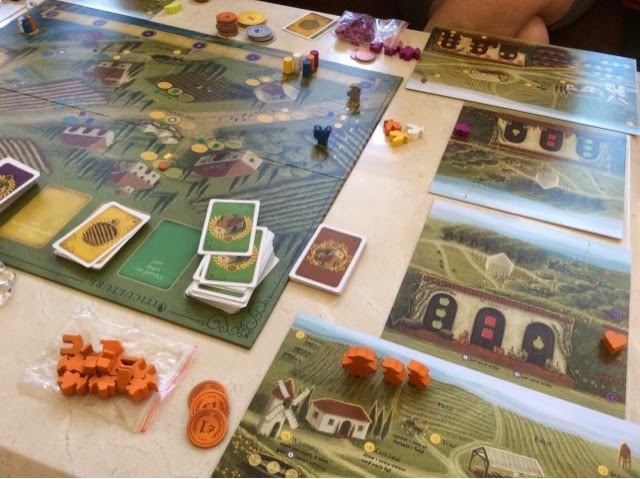 For the many times that I have played Viticulture, I have never touched the expansion at all. So this was quite an exciting prospect for me. Also, I decided to try the lazy man way to victory - no wine orders, just picking up measly points from minor actions. I have never played a game of Viticulture without fulfilling at least 1 wine order before, so I figured this was a nice time to try something new considering there were now more ways to get points thanks to the expansion. Anyway, results first, I came in 3rd with 24 points, our newcomer won at 25 points with the Lira tiebreaker over his girlfriend. So I guess not fulfilling anything was tough, but for awhile I thought I was actually going to win. Haha. Silly me. I got most of my points from giving wine tours, planting vines, and maintaining my workers' morale right at the top each year. This meant that after the end of the year, it would automatically go down, and I just needed one worker to push it up for a point again. Rinse and repeat. Heck, I didn't even press a bottle of wine the entire game! Some winery I'm running right there. Well, this was going all fine and dandy until a few of them caught on to what I was doing, then suddenly everyone was wallowing in points. Grumble grumble. The expansion was pretty neat as it added more options and a little bit of flexibility to the game. You can now plant and harvest olives, apples, and tomatoes. These new resources are used to keep your workers' morale up, or you can sell them for money, or ship them with wine orders for additional points. I like that the new personal board has spaces to do certain things like processing the olives into olive oil, or tomatoes into tomato sauce. 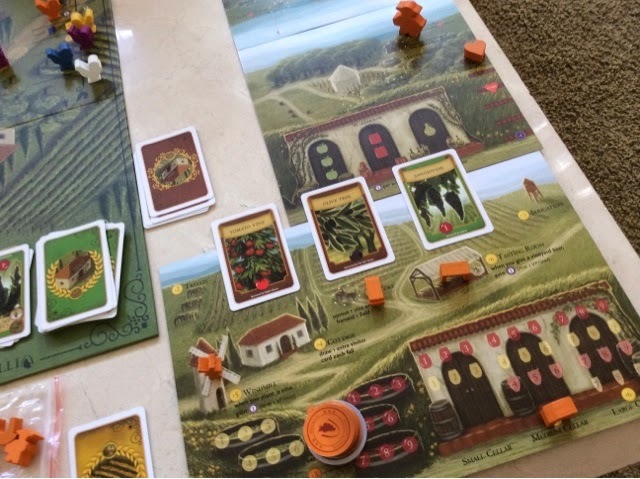 This helps to change the flow of the game whereby you may harvest the olives and tomatoes and smash them at a time when you have no other worthwhile space to choose from the main board. The most important part of the expansion though is that it speeds up the time taken to play the game. With points being easier to obtain through selling of olive/tomato goodness, and maintaining high morale, the game doesn't drag as much as it used to with the higher range of 5 and 6 players. So all in all, I really love what the expansion adds to the game, and if I ever had the choice, I would never play without the expansion again. It doesn't complicate the game much and yet adds enough to make the gameplay faster, more exciting, and more open ended. It does remove some of the tension from some spaces on the main board though. But from what it loses, it makes up for in spades. From peace loving wine making, we jumped straight into war! 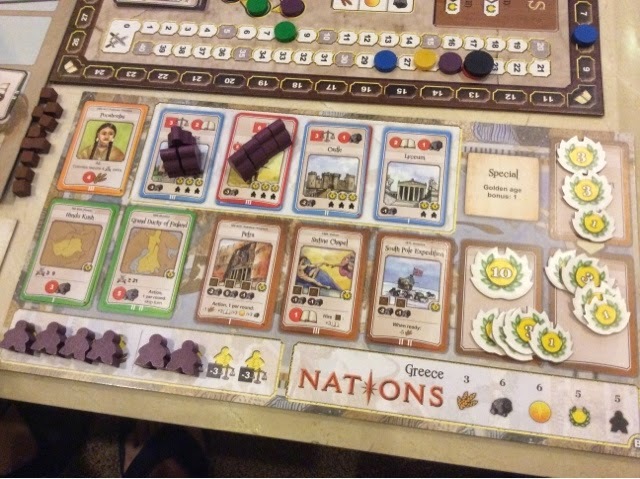 Up next was a 5 player game of Nations. I had learned a small bit of how to play previously, but never had the chance to get a full game in. I will say, before we started, I was slightly apprehensive about the game. None of us with the exception of 1 had played the game before. And we were sitting at 5 players. 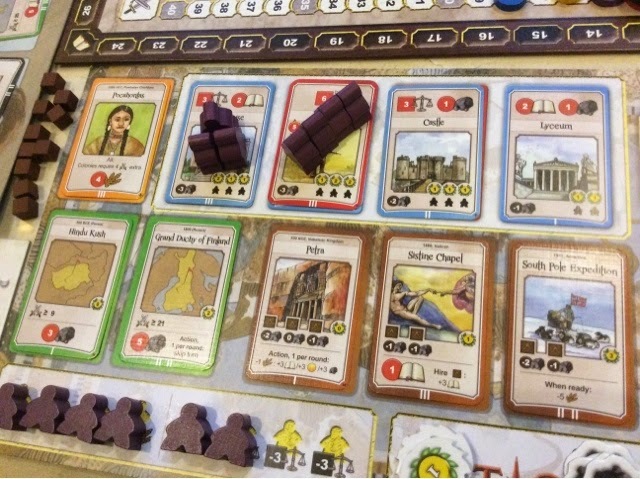 And it was a civilization building game. I immediately saw 5 hours of my life flash before my eyes. And it didn't look pleasant. Well, I think we took about 3 hours? Maybe 3 and a half if I wanted to be picky. But I will say, I enjoyed the game. More than I thought I would (much much more). This wasn't because I was second by 1 point; I think even if I lost badly I would have enjoyed it still. It's still too long for my taste, but I was thoroughly engaged throughout. So much so that I might have AP-ed a bit near the end, which, if you know me, is very rare. Haha. I am usually the one hurrying people along. Go! Go Go GOOOO! Anyway, Nations cannot be explained and will not be explained in this post. It's not actually a complicated game really, just that there are a few areas to note and their effects on the game are vast and tedious to explain without the game being setup in front of you. I will just talk a bit more on the action phase as its the meat of the game. It's only 4 types of actions but the possibilities are so vast. The buying action is the one with the most decision as there are multiple cards to be bought, each with their own effects and abilities. Some give you special actions to execute once per round, some instantly improve your standing on certain tracks, others give you resource income, and some are wonders you want to build for points or more benefits. Everything is so meshed together that you will be spoilt for choice. Hiring an architect is how you build your wonders. Pretty straightforward. Deploying your worker is how you get your income and your instant benefits. Without workers, buying the card is pretty much useless. And once placed, they stay there till you buy a new card to replace the old one, or move them about. Be careful though, when you move them you lose what you gained previously. Tough luck if you run out of "expendable" workers. The special action action is only possible if you bought a card that presents you with that option. 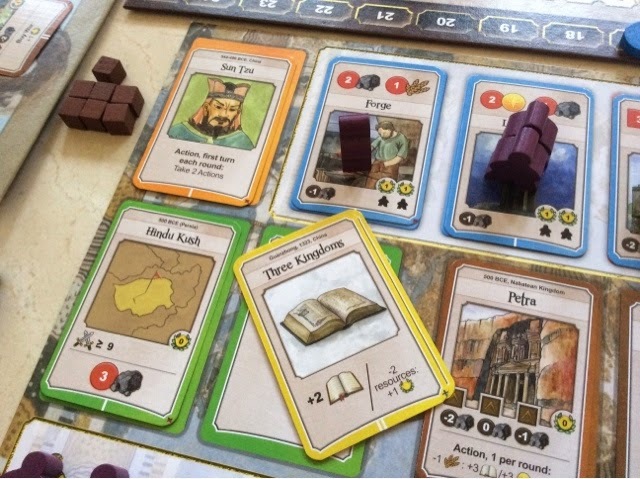 So this goes on and on as players try to buy leader cards to give them abilities, or conquer lands to gain resources or immediate bonuses, or buy war cards to mess with other players, or simply improve their countries infrastructure to gain resources and stability in their land. I was so absorbed by what I could do that I forgot that buying all these things didn't give me any points. Points are obtained by being ahead in the knowledge track which scores 4 times in the game. Points also come from some wonders and having your workers deployed on the later stage cards in your land. In short, points are hard to come by. I spent 2 out of the 4 ages in the game buying stuff that tickled my fancy without realizing that I had no end goal in mind. Haha. I usually ask what the winning score is but I had forgotten this time and went about my own way kinda lost but yet strangely happy in a way. The theme was weak. I didn't feel like I was building a civilization. I felt more like I was building an engine. But that was ok. What was not ok though was the mess of the rulebook. It was so difficult to find out anything in the game. Finding what negative stability does to you was nigh impossible. In the end it was faster to type it into BGG. Haha. But the game was fun. And that was a nice takeaway after spending 3+ hours on it. I think I would have liked it more if it were shorter, and also if the game elements weren't so swingy. You could go from 18 military, to near zero, and then back up to 27 military all in a single round. So its hard to really predict where an opponent could be on a certain track. That was possibly one problem with the game. Things were never final and thus any blocking or management on your end was difficult to path out. Still, I would play it again most certainly, perhaps with lesser players, or when I am in the mood for something long. The last game for the day was my best game of 2013 - Lewis & Clark. Is this still the best game for me from 2013? Well, I don't know. I am wavering a bit, but I still think its a pretty darn awesome game. I had told myself that I wouldn't play this game 5 players again (since my VERY long 5 player game of this sometime back - almost 3 hours), but the game was requested for, so, what to do? We took it out, I taught it as promptly as I could, and off to the races we went ! I decided to use an Indian strategy this time round. Yes, I am not going to be bothered to be politically or diplomatically correct. They are called Indians in the game, so I am calling them Indians. Whatever. Anyway, early on, a card that allowed the player to move along the river per Indian in the boat came up. So I decided that that was what I was going to do. Indian power-up for the win? I bought it, stocked up on Indians, and abused the 2 cards to power ahead of the rest. The mountains got tricky for me but I had the card that let me return an Indian to move 2 spaces and also one that let me move per equipment icon in my play area and my neighbors' play are. The mountain portion took awhile for me to maneuver, but I got through eventually. Well, finally a win for the day. We actually finished the game with explanation in about 2 hours and 30 mins. But we were rushing. The clubhouse was closing and if we didn't end in time we would have to abandon game and get thrown out. We even sat there without air-con nor any air circulation for almost 20 mins. Unbearable. 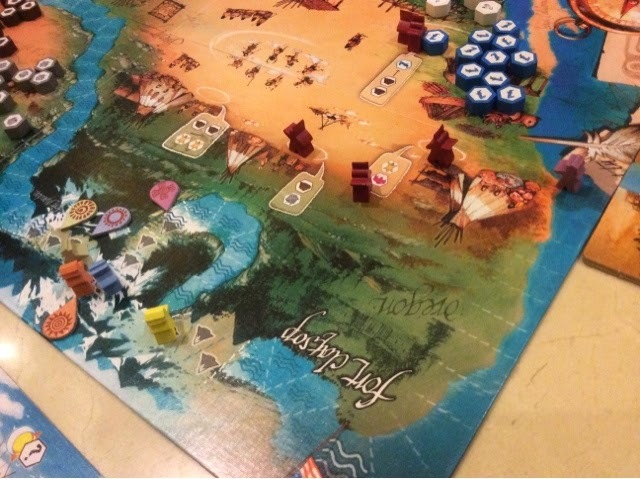 Lewis & Clark, still a very interesting game and one that I feel I just don't play enough of. Wahahahah agree it's Eric's fault!